Aussie Natural’s 1.5l bottled spring water comes in a shrink wrap of 6x, cartons of 8x and can be delivered to your home or office. 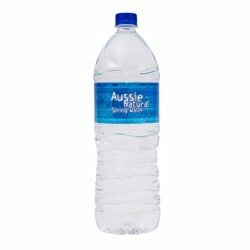 Aussie Natural’s bottled water Perth is the perfect size to carry with you to picnics in the park, or to grab on the sidelines during sporting events! For pure West Australian spring water to last the drive home, rehydrate on the sidelines, or to share with others at a barbecue or picnic, our Aussie Natural 1.5L bottles are the perfect size. Available in cartons of 8, our 1.5L bottled spring water bottles are filled with the same great tasting water that our customers love. Talk to our friendly Perth team about our cartons of bottled water for sale, available to be delivered straight to your door -the home, the office, the workplace, your sports club, or across Western Australia. Keep everyone happy, healthy, and hydrated, with our convenient 1.5L bottled water. Fresh water sourced from the Darling Ranges natural springs, found amongst West Australia’s most pristine national parks, is carefully drawn and transported to our state-of-the-art bottling facilities in Perth. It’s this great tasting water that we provide to our customers, in thirst-quenching 1.5L bottles. Our bottles are made from PET plastic, and are fully recyclable- minimising our impact on the environment. At Aussie Natural Spring Water, we’re proudly Perth’s premier spring water suppliers, providing quality spring water at competitive prices- whether it’s bottled water, water coolers, water filters, or anything in between, Aussie Natural Spring Water can provide clean, refreshing water to meet a range of needs and requirements, at competitive value that doesn’t cut down on quality.